Explanation: Only in the fleeting darkness of a total solar eclipse is the light of the solar corona easily visible from Earth. Normally overwhelmed by the bright solar disk, the expansive corona, the sun's outer atmosphere, is an alluring sight. But the subtle details and extreme ranges in the corona's brightness discernible to the eye are notoriously difficult to photograph. 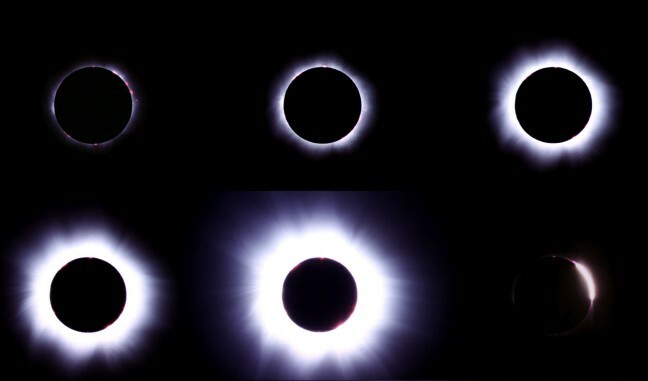 In this series of images recorded from Siofok, Hungary during the total phase of the August 11 eclipse, progressively longer exposures (top left to bottom center) have been used to more faithfully capture different regions of the elusive solar corona. The final image (at bottom right) shows light from the solar disk emerging from behind the moon's edge at the end of totality.